Natural gas production in Texas in Q1 2015 declined 1.5 billion cubic feet per day (bcf/d), results from the Texas Railroad Commission (RRC) show. 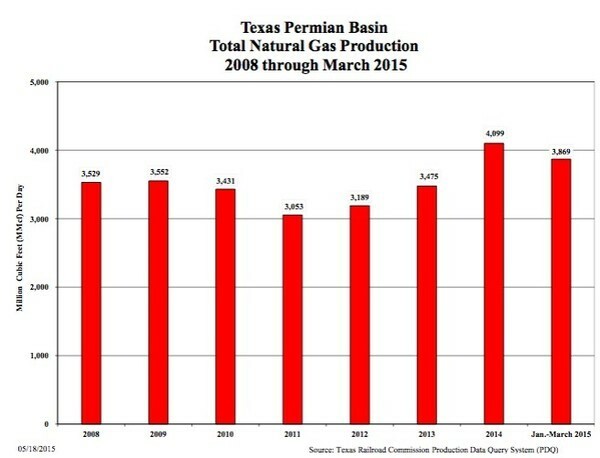 That’s a 5.5% decline on the 22 bcf/d Texas produces—a full one third of all natural gas production in the USA. Conservatively, I expect a 15% decline in the Lone Star state for all of 2015. That would result in a loss of more than 3 bcf/d. In fact, that’s very conservative as the collapse in Texas rig count from 891 a year ago to only 373 for the week ending 5/15/2015—a 58% drop—is having a profound impact on gas production in the state. The combination of thousands of wells drilled in the past few years that are still in the high-decline portion of their lifecycle and such a large reduction in drilling activity indicates that Texas is on track for an epic decline in gas production in 2015. Now, considering there is usually a six-month lag between falling rig counts and declining production, the drop in Texas in the first three months of 2015 is remarkable. More importantly, the quick drop in Q1 indicates the second half of year is likely to see a more pronounced fall off in production barring a quick rebound in activity. Now, let’s look at what the raw data is showing for each of the major gas producing basins in Texas, and what recent developments in Texas tell us about production for the rest of the US. The Barnett is the oldest modern shale play in the US with over 20,000 wells drilled into it over the past 15 years and has more than 16 Trillion Cubic Feet (TCF) of historical production. Many analysts and operators have long professed that Barnett wells will produce for 40 years and have terminal decline rates in the 5 to 7 % range. Devon Energy told me a few years ago that their engineers have estimated that the company’s wells in the play have a 6 % terminal decline rate. However, history is indicating a much steeper rate. Given that Devon is still the largest operator in the Barnett, the company’s estimate of terminal decline appears to be grossly understated considering the large fall in production in first 3 months of 2015. One would expect that the average Barnett well decline rate would now be in the high single digits given that the average age of each well is more than 5 years old. However, this has not been the case. 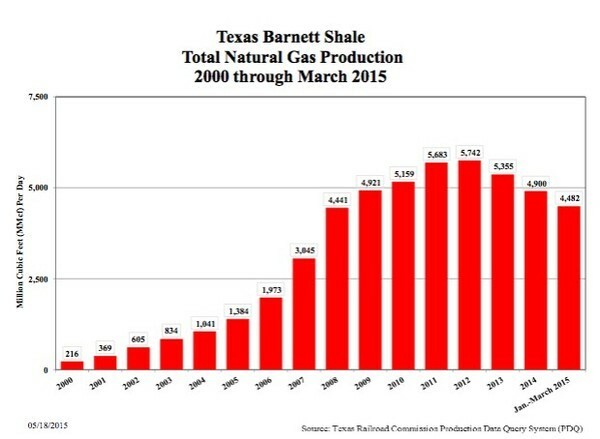 The Barnett shale is on pace to decline an incredible 20 % in 2015 despite the drilling of new wells. Put differently, the Barnett is on track to see production fall from an average of 4.9 bcf/d in 2014 to only 3.9 bcf/d this year. The reason for the drop-off in Barnett production (and other shale gas plays) is quite simple; despite improvements in technology, the average well is becoming less productive (i.e. lower initial production (IP) rates and has a lower estimated ultimate recoveries (EURs)). There are two main reasons for lower well productivity: 1) declining rock quality 2) and interference with neighboring wells. It has been well documented how the best wells come from small geographic areas commonly known as “sweet spots” and the further away from these areas the less productive wells become. In the Barnett, the average new well in 2014 came online with an IP rate of less than 1 million cubic feet per day, down 20 % over the previous few years (Source: Drilling Deeper, David Hughes), and will recover less than 1 bcf in its lifetime. My estimate of 1 bcf of lifetime production is due to the .8 bcf the average well has recovered in the first five years of life and a realistic life expectancy of between 7 to 8 years. While many analysts predict the average Barnett well will produce for multiple decades, the facts say otherwise. More than 4,000 (20 %) of Barnett wells are already dead after less than a decade of production indicating a realistic lifespan of less than 10 years. In fact, very few wells with a production history of ten years are still producing. So how drilled out is the sweet spot of the Barnett? Answer: Very. The top three Barnett counties by historical production, Denton, Johnson and Tarrant, (about 75% of the Barnett’s historical production) already have more than 6 wells per square mile (640 acres or 5,280 square feet). With fracture stimulations usually deploying energy in the reservoir at least 500 feet to nearly 1,000 feet in every direction from the wellbore, many wells in these three counties are producing from the same acreage. While communication between wellbores will not always become apparent immediately after a well is drilled, lower than expected lifetime EURs are proof positive that too many are drawing on too few resources. So what does the path forward for the Barnett look like? With only 5 rigs running in the Barnett for the week ending May 15th, down from 25 a year ago according to Baker Hughes, it is clear we are seeing a permanent wind down of activity in America’s oldest modern shale play. Based on recent new well productivity numbers for the Barnett, approximately 1,200 wells would be needed to keep current production flat in 2015. However, we are miles away from this level of activity. I estimated that the five rigs currently running in the play will drill between 50 and 100 new wells this year. In fact, production in the Barnett is declining so much faster than expectations that producers are now having to pay what’s called “shortfall fees” to pipeline operators. That means they pay for the space on the pipeline for their gas—even when the gas just isn’t there. While CHK’s finances are in great difficulty due to its large interest and preferred dividend obligations and falling revenue, its remaining locations in the Barnett must be extremely uneconomic for it to pay “significant shortfall fees” for pipeline capacity it has already contracted for. Over the next three years I expect Barnett production to decline from approximately 4.5 bcf/d currently to 2.5 bcf/d given the advanced maturity of the play and the actions of its biggest operators. 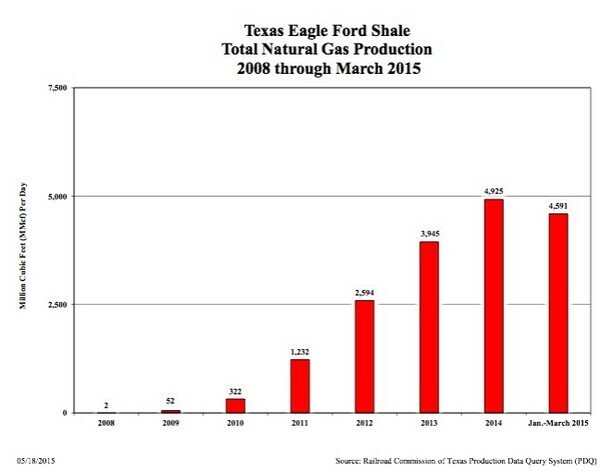 I estimate that the huge decline in drilling in the Eagle Ford (the rig count has fallen to 108 from 219 a year ago) combined with very large well decline rates will cause production to drop approximately 0.75 bcf/d in 2015. Even though the Eagle Ford has 21 times the number of rigs running as the Barnett, it will see a similar natural gas production decline. As drilling has moved to the oiliest part of the play (such as Karnes County) as operators high grade their drilling prospects, each new well drilled this year will produce less gas than a new well drilled last year. Considering the annual field decline rate for the gas portion of the play (how much production would drop if no new wells were drilled) is 47 % (Source: http://www.postcarbon.org/wp-content/uploads/2014/10/Drilling-Deeper_PART-3-Shale-Gas.pdf) and the 3-year decline rate is 80 %, production from the Eagle Ford production is likely to continue to fall for several years barring an immediate and significant pick up in drilling activity. Times have changed drastically in the Permian Basin over the past year. The rig count has collapsed more than 60 % and shows no sign of rebounding without significantly higher prices. Though gas production in the Texas Permian is down only .2 bcf/d in the first three months of the year, I estimate there will be a drop of .4 bcf/d for the entire year given that associated gas production typically has very steep decline rates. While the Granite Wash play of North Texas and Oklahoma does not get as much attention as shale plays, it has been an important contributor to both US oil and gas supply in recent years. The downturn in prices has cut drilling in the play from 62 rigs a year ago to only 16 today and as you would expect, production in the Texas portion of the play has rolled over. As you can see from the below graphic, natural gas production is already down .25 bcf/d, or 26 %, in the first three months of 2015 and now at levels last seen in 2008. 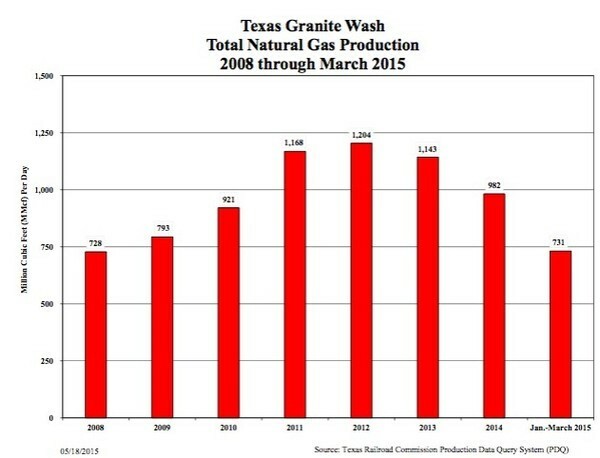 Texas Granite Wash production appears on track for a .5 bcf/d fall in 2015 given the lack of drilling. Texas still produces between 6 and 8 bcf/d of conventional natural gas depending on how you classify a portion of the gas production from the Permian Basin. Given that very little drilling has taken place in the past six months on conventional prospects in Texas or anywhere else in the country, I estimate that conventional production in the state has fallen .3 bcf in the first quarter of 2015 and is on track to fall .6 bcf/d for the year. For example, one of the largest areas of conventional production in the state is in south Texas where operators have been producing from the Frio and Vicksburg formations for decades. This area has very high decline rates and has seen limited drilling in recent years due to low prices and its advanced maturity. With Texas producing about a third of all natural gas produced in the US on an annual basis from a variety of different formations, it is an excellent proxy for the US industry as a whole. For example, though other states such as New Mexico and Oklahoma did not experience the drilling boom to the same degree as Texas, and each state has seen its rig count fall substantially over the past 12 months. New Mexico’s rig count has gone from 89 to 44 in a year—a 50 % drop—while Oklahoma’s has fallen from 195 a year ago to 103 recently—a 47 % drop. Overall, investors can reasonably expect a material drop in natural gas production in every gas producing play in America with the exception of the Marcellus and Utica where production looks to have flattened out in Q1 2015. In other words, with US natural gas production in decline and activity levels at multi-year lows at the same time demand continues to ramp up, prices should move materially higher during the balance of the year. EDITORS NOTE–Higher natural gas prices will first benefit the lowest cost producers. My favourite junior producer already has a huge play where the wells payout in just 12 months at current prices. That’s unheard of! It gives investors a free call on natural gas prices rising–and one of my Top Picks for the second half of 2015. Click here to access the name, ticker, and full report on this low cost producer. Next post: What’s So Bullish About Canadian NatGas?